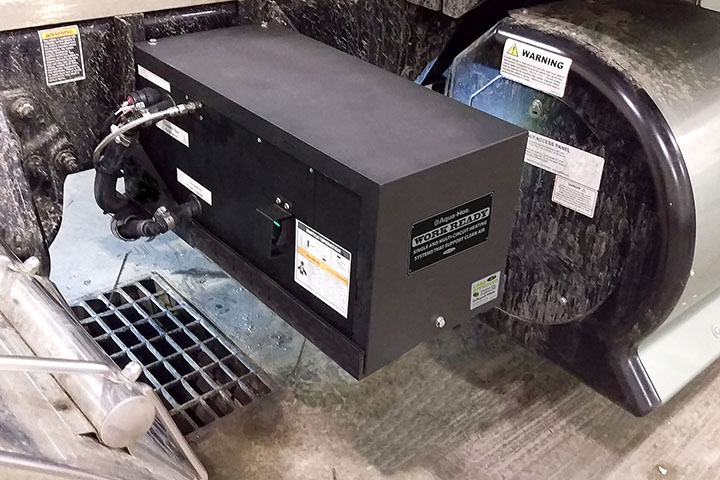 Learn which vehicles have added Aqua-Hot heating systems to their models and stay up to date on the new products and services from Aqua-Hot. We're continuing to make the road a more comfortable place for you. 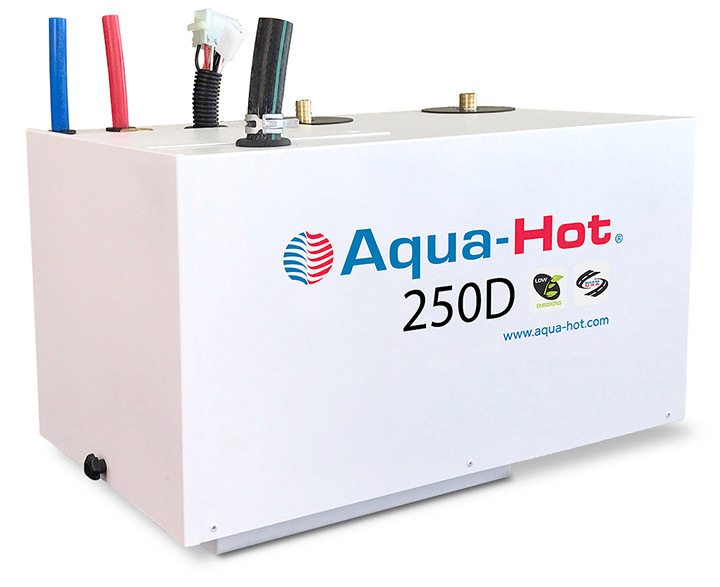 Aqua-Hot Heating Systems, the leader in RV hydronic heating solutions, has added the 250D to its 200 Series line-up. Ideal for smaller RVs that already have diesel onboard, it debuts at RVX, March 12–14, Salt Lake City, booth 2339, and is already available on Tiffin Motorhome's Allegro RED as an option. 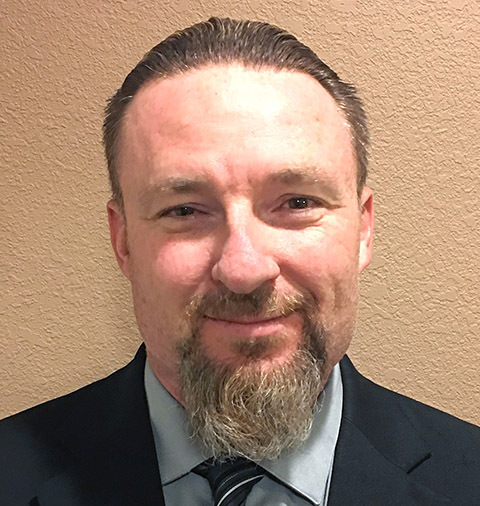 Aqua-Hot Heating Systems has promoted Jeremiah Bustamante to director of manufacturing. 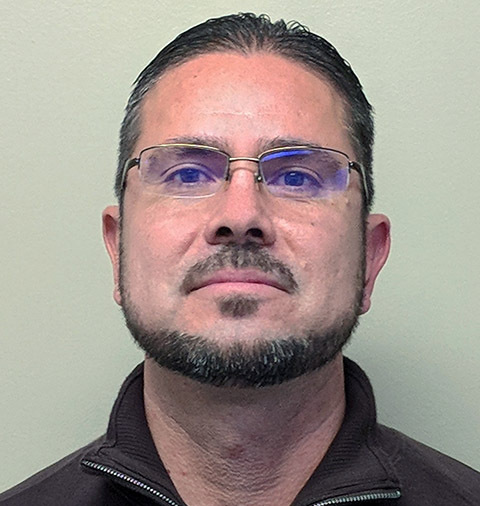 Formerly the production manager, Bustamante is the Frederick, Colorado-based company's most tenured employee. General manager Travis Smith made the announcement. 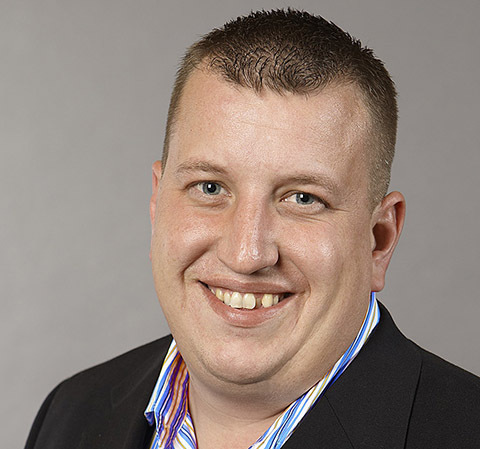 Moving into the 2019 model year, REV Recreation Group continues to strengthen its relationship with Aqua-Hot Heating Systems. 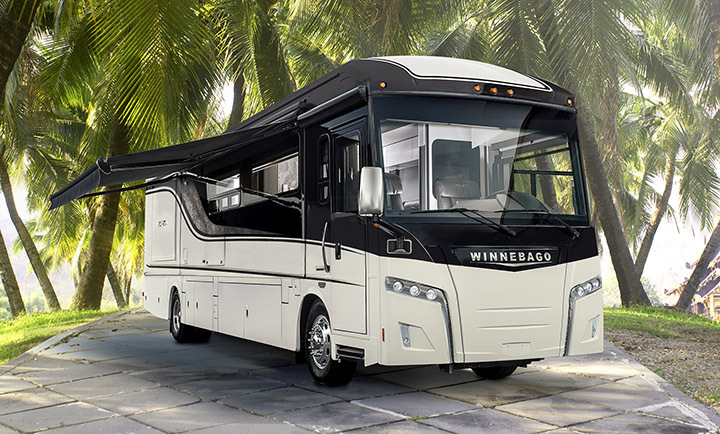 The RV builder offers the innovative 400D hydronic heating solution with on-demand hot water as a standard feature in its Fleetwood Discovery and Discovery LXE, Holiday Rambler Endeavor, and Monaco Signature and Marquis Class A Diesel luxury motorhomes. 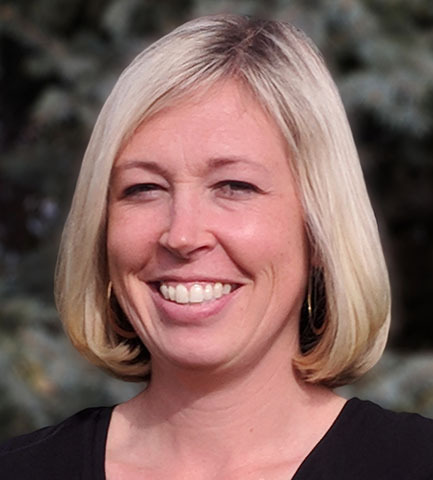 Aqua-Hot Heating Systems is offering its Certified Technician Training in three additional regional locales this year, as well as at its Colorado facility. On August 14, it will be in Tampa, Florida, and on August 15, Lake City, Florida. October 2, the course is available prior to the NRVIA (National Recreational Vehicle Inspectors Association) Inspectors Conference, Oct. 5–7, in Athens, Texas. Aqua-Hot Heating Systems, the global leader in hydronic heating solutions for RVs, UTVs, and on- and off-highway vehicles, has been named a finalist in ColoradoBiz magazine's annual Made in Colorado awards. The company was selected from hundreds of nominees to earn a spot in the final round of judging. The highly esteemed top five will be announced at the publication's March 1st event at Mile High Station in Denver. 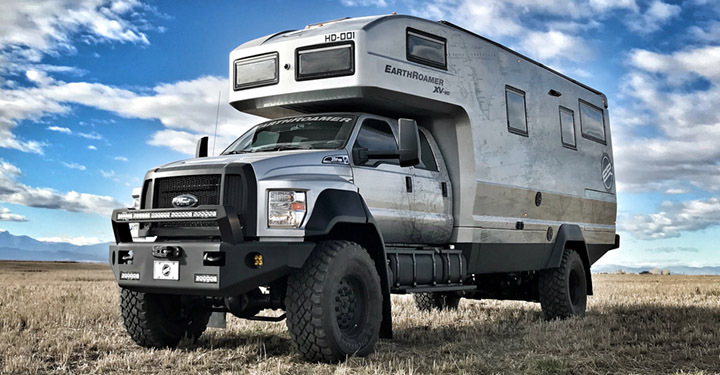 One of the most unique RVs to debut this year is the EarthRoamer XV-HD. The self-sufficient, off-road Super C class luxury camper comes with an Aqua-Hot 600D hydronic heating solution for maximum comfort, no matter how far off the grid the vehicle may wander. The Aqua-Hot 600D delivers 65,600 BTUs of quiet, evenly-distributed heat throughout the XV-HD and offers on-demand hot water. 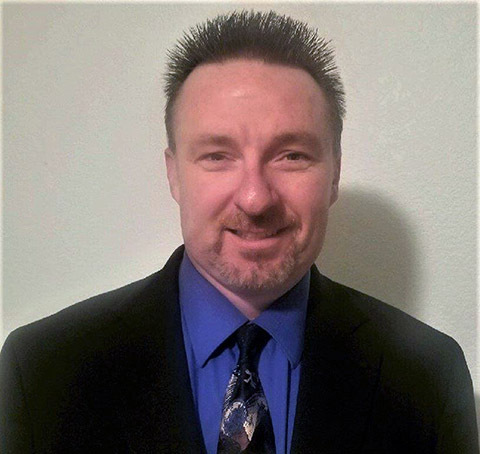 Aqua-Hot Heating Systems is bringing its Certified Technician Training Program to Heber Springs, Arkansas. Held in conjunction with the National Recreational Vehicle Inspectors Association (NRVIA) conference, the Oct. 23 session counts for eight credit hours towards RVDA-RVIA certification/ recertification. Registration is at www.aquahot.com/authorizedservicetraining. Aqua-Hot Heating Systems has launched a redesigned webstore to sell installation components, parts and accessories for its line of hydronic heaters. The online shopping environment is at https://secure.aquahot.com. 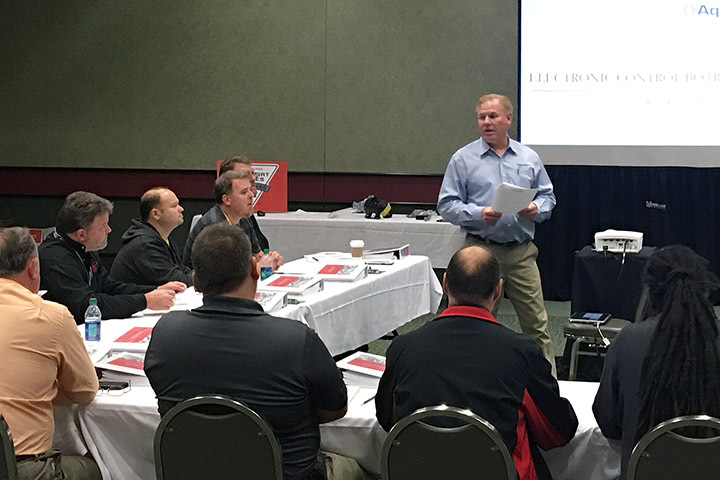 Aqua-Hot Heating Systems will offer its Certified Technician Training Program on July 24 at the National Indoor RV Center (NIRVC) in Atlanta, Georgia. The session counts for eight credit hours towards RVDA-RVIA certification/recertification. Registration is at www.aquahot.com/authorizedservicetraining. 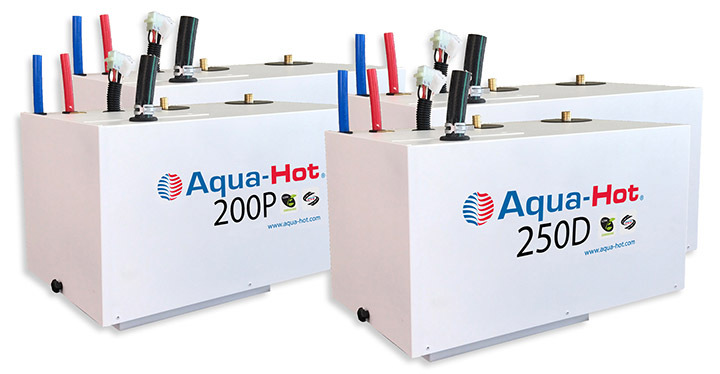 Aqua-Hot Heating Systems, leader in on- and off-highway vehicle hydronic heating, introduces a new program covering many of its Aqua-Hot and Hydro-Hot products that were manufactured over the past 30 years. Now, coach owners can have their Aqua-Hot units remanufactured with improved technology, at a cost significantly lower than a new system. 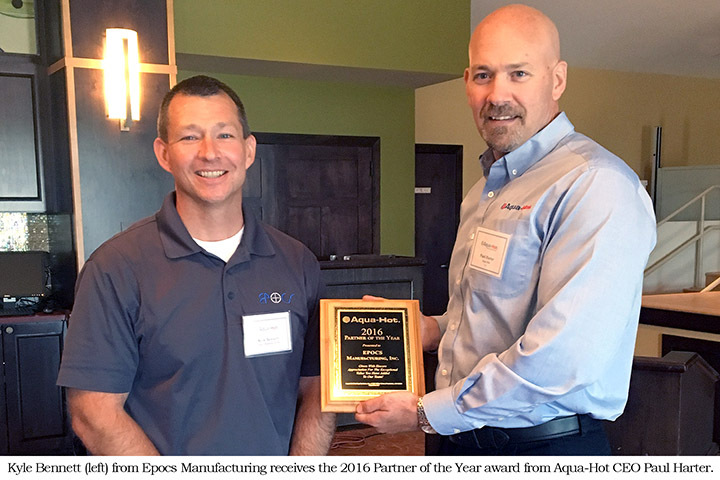 In its continuing commitment to enhance its partnerships, Aqua-Hot Heating Systems recently hosted its 9th Annual Supplier Day, at the Todd Creek Golf Club in Frederick, Colorado. Aqua-Hot personnel and representatives from 20 suppliers attended. The legacy of Aqua-Hot Heating Systems' founder, Harold "Hap" Enander, the Enander Family Foundation Fund, reached a milestone in giving. Since it began in 2012, the charitable organization has given over $1M in grants. Born Free builds some of the finest Class C motorhomes in the country, using only top-quality components. When customers are configuring their dream RVs, many choose innovative Aqua-Hot Heating Systems to make their luxurious coaches even more comfortable. 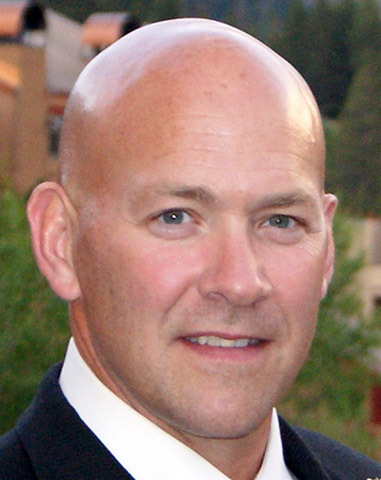 Paul Harter, president and CEO of Aqua-Hot Heating Systems, was elected chairman of the Northern Colorado Manufacturing Partnership (NoCO Partnership). The regional, volunteer association consists of manufacturers, educational institutions, economic and workforce development groups, and partner organizations. It connects public and private enterprises to achieve shared goals and further community interests. Aqua-Hot Heating Systems is growing manufacturing in Colorado. Aqua-Hot collaborated in a recent video production that showcases Colorado manufacturing. 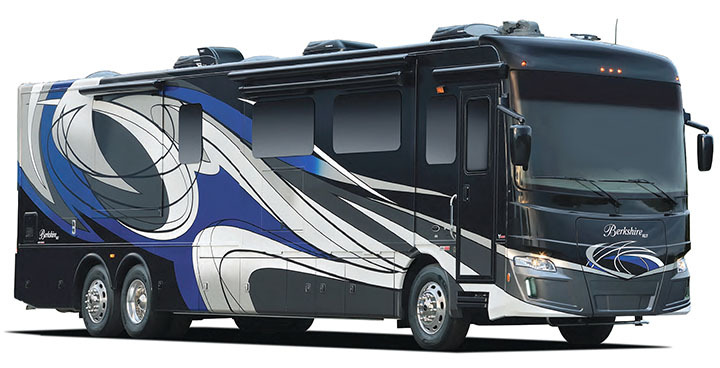 Further solidifying its relationship with one of the most well-respected RV builders, Aqua-Hot is now offered on all Phaeton models from Tiffin Motorhomes. 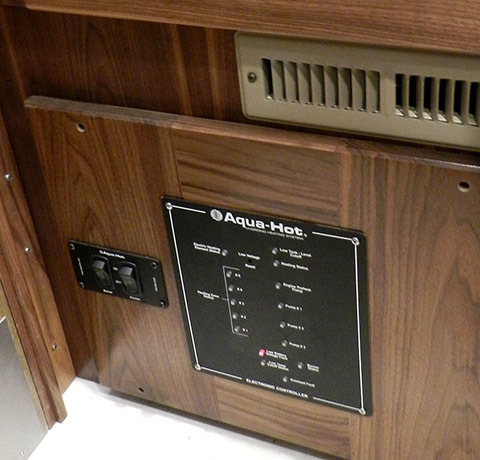 RV enthusiasts can experience Aqua-Hot's 400-D hydronic heating system on the Phaeton 36 GH, 40 AH, 40 QBH, 40 QKH and 42 LH. Tiffin's Allegro Bus and Zephyr models already offer the 450. When temperatures drop, many fleet crew members have to come in early to get vehicle engines cranking before other workers arrive or trucks are sluggish until the engine warms up. Now with Aqua-Hot's Work Ready Single Closed-Circuit heating system, trucks are ready to roll at the same time as their drivers. Workers no longer need to wait for heat as the Work Ready Systems eliminate the need to idle the engine, reducing engine wear, emissions, downtime and slow starts. ﻿To support its factory authorized service centers, Aqua-Hot has announced the dates of its 2014 Aqua-Hot Certified Technician Training Classes. The comprehensive program covers all of the company's current and past products. After completing the two-day session, participants are credited 16 hours of training toward RVDA-RVIA service technician recertification. Working for 30 years to make this move, Aqua-Hot Heating Systems is relocating to a new headquarters and manufacturing facility. 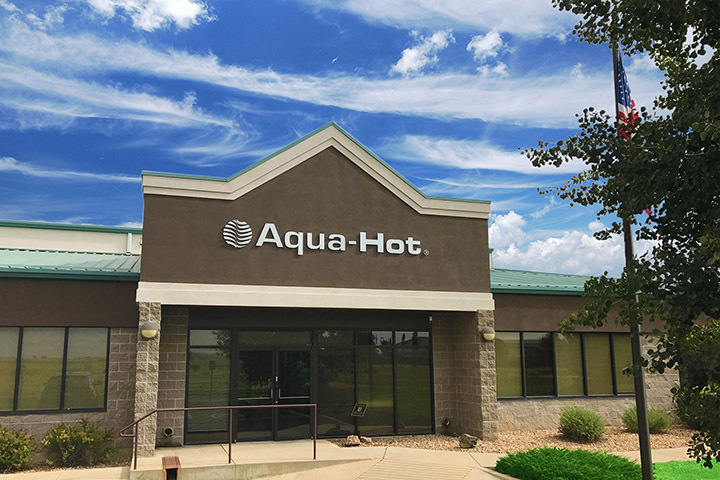 Starting July 29, Aqua-Hot will be up and running at its new facility in Frederick, Colorado. 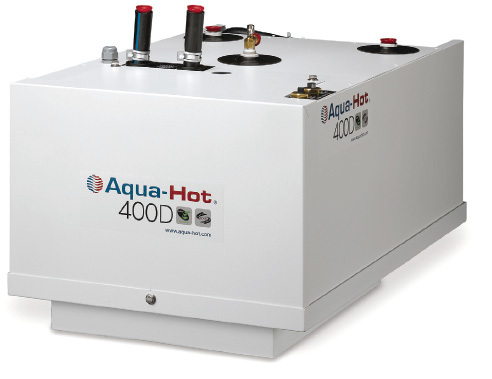 The new Aqua-Hot 400LP Hydronic Heating Unit's compact design lets fifth wheel and propane-equipped motorhome owners finally experience the comfort of continuous hot water and superior interior heating. The 400LP delivers both amenities using propane fuel or AC power from a single, dual-circuit system. 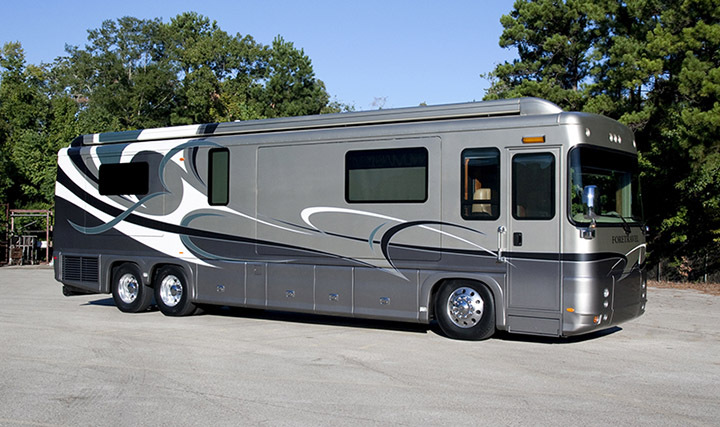 Foretravel Motorcoach knows the value of offering Aqua-Hot Hydronic Heating Systems on its luxury coaches. With the Aqua-Hot 600 already available on its IH and Phenix RV models, Foretravel is now offering the Aqua-Hot 450 model on its Nimbus coach. For almost two decades Tiffin Motorhomes has been known for quality and it's evident in every RV it builds. 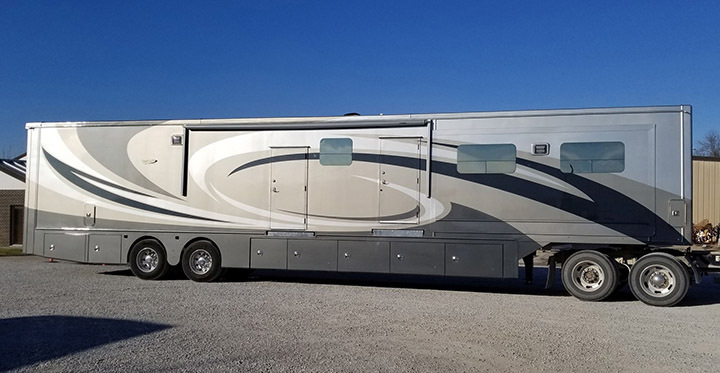 With Aqua-Hot Hydronic Heating Systems being offered as standard equipment on the Zephyr and Allegro models for quite some time, Tiffin Motorhomes owner Bob Tiffin took a cross-country trip with the newest version and was finally impressed.